“Empathy is the ability to experience another person, another creature, a forest, a lake, nature and all the world inside yourself. This process is a drastically different and a far deeper and more errorless form of communication than the one we are all used to nowadays. Our mission is to find and develop this ability, and then to share it with people by means of music. This is how we might plant a seed of a new experience or help revive a forgotten one. And this is the reason why our band has such a name and our music can hardly be limited by one certain style only. Empathy Project is actually our way”. Empathy Project concerts are not just about performing for the audience, but also about offering a mutual process. This is a powerful flow of music of different genres and styles, which rushes to you from the stage. The majority of pieces were composed by band members themselves. And the audience comes in order to co-exist rather than only to listen. The band’s repertoire is based on solo songs and vocal duets. Dmitry’s polyphonic compositions created by means of Loop Station stand apart. The musical language of the band is rather non-homogeneous. One can find both pieces with complicated rhythmical and harmonic patterns and compositions which are easier for perception. Quite often, this contrast is included into one track. The music is a mixed blend of jazz, folk, rock, contemporary, indie, funk, pop etc. The project’s leaders are Dmitry Vasilyev (vocals, double-bass) and Alexandra Kurkova (vocals). Their collaboration gave start to the idea of the band. Both musicians grew up on folk music and have acquainted themselves with jazz traditions of Saint Petersburg. The band appeared in 2011, and its very first steps were made in the direction of jazz mainstream. 2012 was a turning point for the band. Dmitry and Alexandra performed with a solo concert in Cannes (France) as part of Suquet Musical Nights festival. The audience met the band warmly, which marked a new stage in the band’s development. 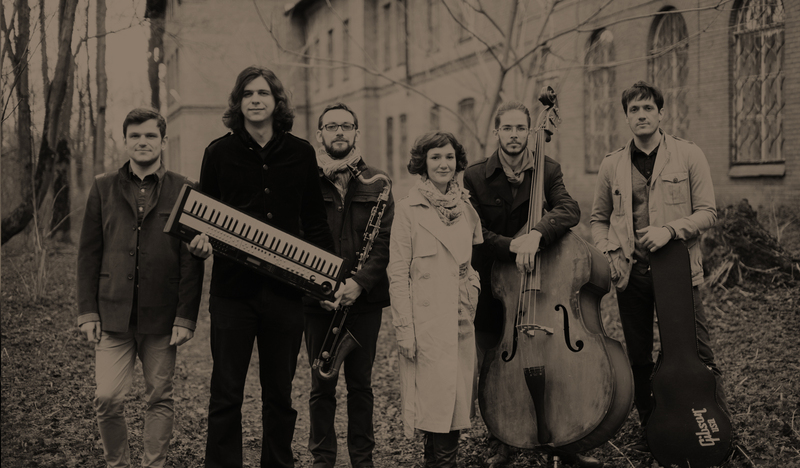 It took the name “Empathy Jazz” (a quartet with Lera Gertzenova on keys and Denis Kaverznev on drums) and in 2012 became the prize winner of the contest “Autumn marathon” (“Osenniy maraphon”). After that the band started its advancement in Saint Petersburg jazz world. In 2015 Lera left the band and was substituted by Grigory Bazhanov, an outstanding pianist and Dmitry’s old friend. The new band became the prize winner of international competition “Gnesin-Jazz”. Soon after that the band was invited by Andrey Kondakov to contemporary music festival “Close Encounters”. That was another turning point. A decision was made to extend the band to sextet and prepare a new program which had been maturing long before that and which was not limited by mainstream jazz esthetics. New “Empathy project” included Viktor Arkharov (woodwind) and Semyon Klimenok (guitars). The band has had the same members until now. Apart from contemporary and original music, the band still performs with jazz mainstream program.